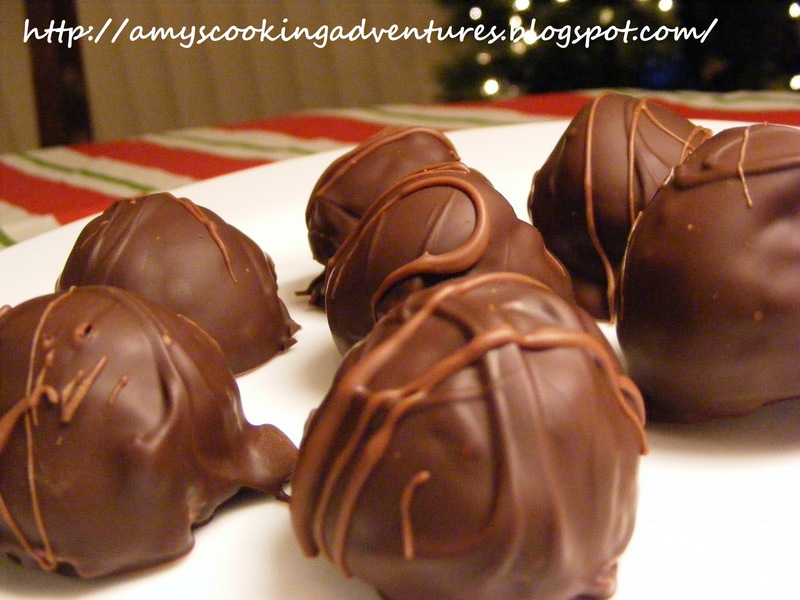 At Christmastime, one of the favorite treats to make (and eat) is truffles. Truffles have become my signature treat at the family Christmas. In the past, I have done a simple chocolate and cream cheese truffle, but this year, while obsessing about peanut butter, I decided to branch out a bit and do some creating. And thus Peanut Butter Pretzel Truffles were born. They are not too sweet and a real delight for any salty-sweet lovers out there. The only problem I have now is hiding them from my husband so I still have some on Christmas Eve! 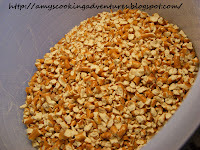 Pour pretzels into a food processor and grind down to coarse crumbs. You could also put them in a ziplock bag and smash them with a rolling pin, but a food processor is easier. Stir in peanut butter, ½ cup at a time until it is evenly blended. Refrigerate for 1 hour to let the peanut butter firm up. Line several cookie sheets with waxed paper. Using a small cookie scoop or melon baller, scoop small balls of peanut butter mixture onto prepared cookie sheets. Don’t worry if they aren’t perfectly round, chocolate covers many imperfections! Using a double boiler (or microwave if you prefer) melt chocolate, taking care to keep water from mixing with the chocolate. Once chocolate is melted, remove from heat (you can always put the bowl back onto the pot if your chocolate cools). 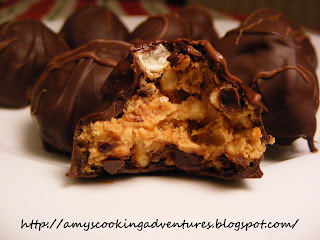 Using 2 forks, carefully pick up a peanut butter ball and roll it gently through the melted chocolate. Pick up the covered truffle with the forks and allow the excess chocolate to drip off. Place the truffle on a clean sheet of waxed paper to set. Repeat for all truffles. Drizzle with almond bark, if desired. Once the cookie sheet is full, place in refrigerator for at least 30 minutes for the chocolate to harden. Move truffles to an airtight container and store in the refrigerator. Oh Amy, these look amazing! 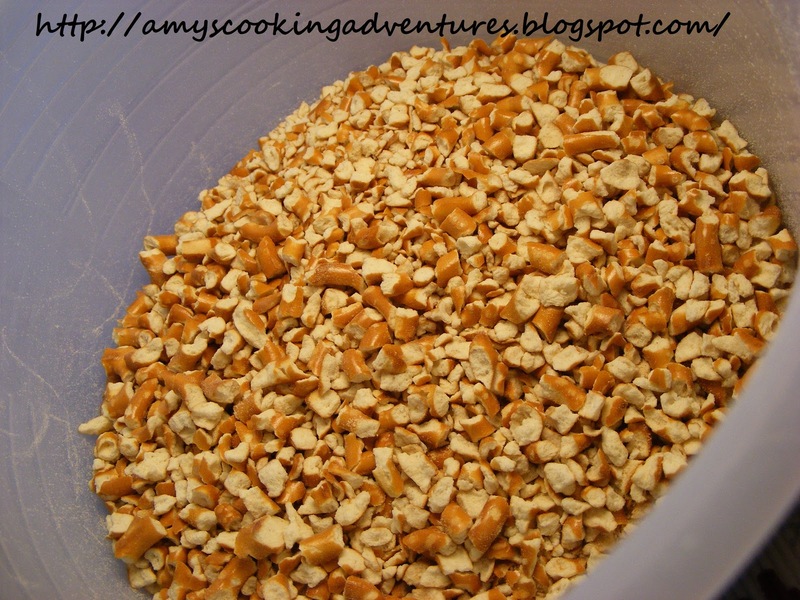 I absolutely LOVE a sweet-salty combination, especially with pretzels and chocolate. I will have to give these a try soon. Thanks so much for sharing this simple and delicious recipe, and your talents in the kitchen! Have a great weekend.